The present case report describes a case of a maxillary first molar with an unusual location of MB2 orifice and canal which is not yet reported in literature. An additional orifice was located adjacent to the palatal orifice which is an unusual occurrence. A 45-year-old male patient reported with a chief complaint of continuous and radiating pain in relation to left maxillary first molar for several days. On clinical examination, the patient's oral hygiene was found to be fair. Dental examination revealed a left maxillary first molar with a deep carious lesion and there was a full coverage restoration in relation to left maxillary second premolar. 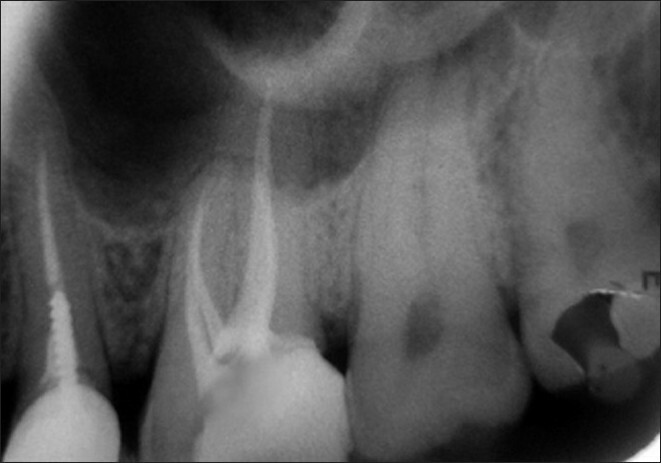 The patient also complained of episodes of sensitivity to hot and cold in the involved tooth. Clinical diagnosis was irreversible pulpitis. A preoperative radiograph was obtained [Figure 1]. After detailed clinical and radiographic examination, the left maxillary first molar was prepared for nonsurgical endodontic therapy. After administration of local anesthesia, tooth was isolated with a rubber dam and a conventional endodontic access opening was made [Figure 2]. After removing pulp tissue located in the chamber, four orifices were observed - palatal, mesiobuccal and distobuccal located in regular locations and an extra orifice was located very close to the palatal orifice and was presumed to be a second palatal orifice. The conventional triangular access was modified to a trapezoidal shape to improve access to the additional canal [Figure 3]. 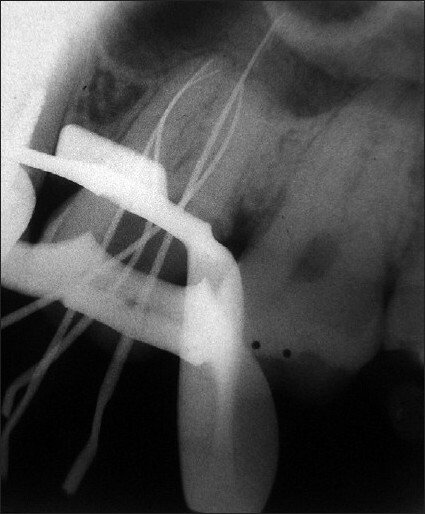 The working length of each canal was estimated by means of an electronic apex locator (Root ZX; Morita, Tokyo, Japan) and then confirmed by a radiograph [Figure 4] and then access was closed with a temporary restoration. There were no variations like second palatal root/ canal observed in the pre-operative radiograph and working length radiograph suggested that the instrument in the extra canal was an MB2, but at an unusual location i.e., adjacent to palatal orifice. At the next visit, the canals were initially instrumented with #15 nickel titanium files (Dentsply Maillefer) under irrigation with 5% sodium hypochlorite and 17% EDTA. Coronal flaring was carried out by using gates glidden burs (numbers 3 and 2; Dentsply Maillefer). Cleaning and shaping of the canals was done by using hand nickel titanium Protaper file system with a crown-down technique similar to that described by Saunders and Saunders. 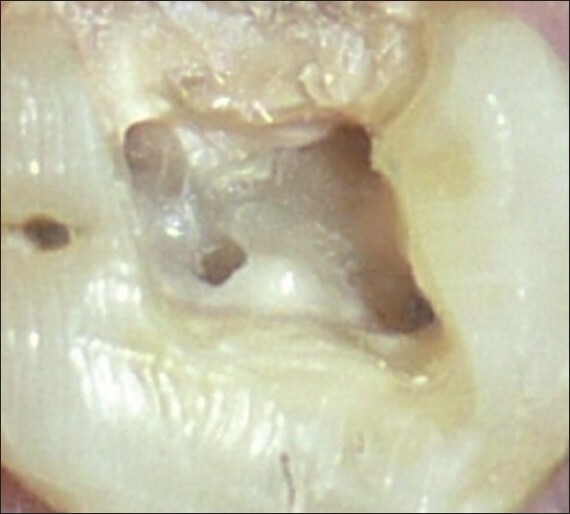 The canals were obturated with AH plus resin sealer (Dentsply Maillefer, Ballaigues, Switzerland) and gutta-percha points using lateral condensation technique. 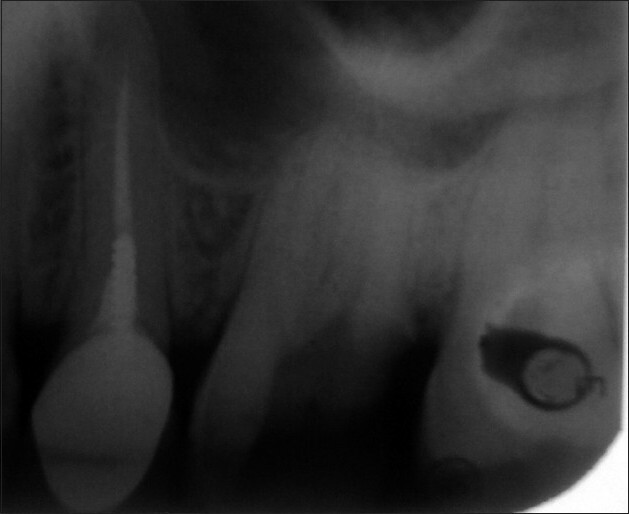 The access cavity was then restored with posterior composite filling (P60; 3M Dental Products, St. Paul, MN) [Figure 5]. Majority of endodontic literature describe the maxillary first molar as having three roots and four root canals, with two canals in mesiobuccal root. 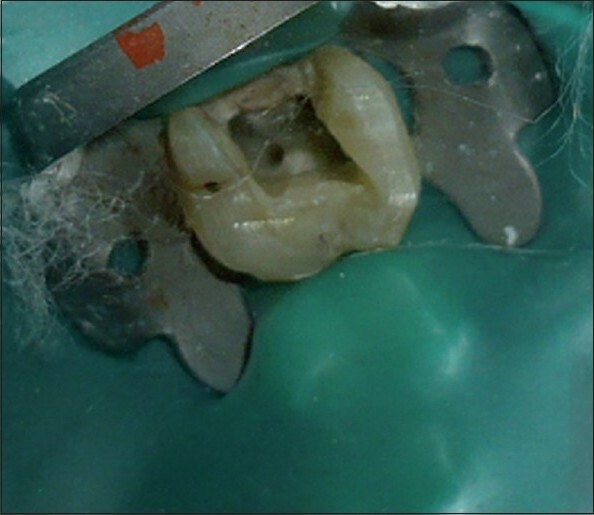 In most of the teeth, the location of MB2 orifice opening is usually found mesial to an imaginary line between the MB1 and palatal orifices, and at about 2 to 3 mm from the MB1 orifice. This report highlights the unusual presence of MB2 canal orifice in maxillary first molar adjacent to the palatal orifice which was not reported in literature till date. Tachibana concluded that applicability of computed tomography (CT) for endodontics allowed the observation of the morphology of the root canals, the roots, and the appearance of the tooth in every direction. Gurmeet Singh et al, have used SCT for the confirmatory diagnosis of morphological aberrations in the root canal anatomy. In the present case, working length radiograph revealed that the orifice was that of MB2 canal. Additional canal such as MB2 in maxillary molar is a frequently encountered clinical situation. Usually, this additional canal is located adjacent to MB1 but in this instance, it is found to be adjacent to palatal orifice. Such aberrant location and confirmation were possible with the use of intra oral periapical radiograph. The finality in locating the canal especially in challenging situations buttresses the need for use of non-invasive and advanced gadgets such as CT.
2. Weine FS. Initiating endodontic treatment. In: Weine FS, editor. Endodontic Therapy. 6 th ed. St. Louis, MO, USA: Mosby; 2004. p. 106-10. 6. Somma F, Leoni D, Plotino G. Root canal morphology of the mesiobuccal root of maxillary first molars: A micro-computed tomographic analysis. Int Endod J 2009;42:165-74. 7. Reddy PY, Kumaraguru K, Subbarao CV. Management of dens invaginatus diagnosed by spiral computed tomography: A Case report. J Endod 2008;34:1138-42.